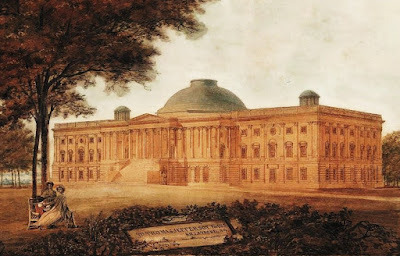 On December 3, 1822, the Congress of the Holly Alliance in Verona (October 8 – December 3, 1822) concluded its proceedings. At Verona, the rulers of continental Europe decided the invasion of a 100.000-men French army in Spain, in order to crash the revolution of the Exaltados, the anti-monarchic revolutionaries in Spain. Also, at Verona, the hegemons of Europe made the grave (hubristic) mistake to consider a transatlantic joint military intervention of the Holly Alliance in the American continent, in order to re-consolidate colonial order in South and Central America: The successful Austrian invasion in Italy last year (1821) against the Carbonari, the Italian revolutionaries, along with the imminent French invasion in Spain (1823), constituted an effective reactionary counter-revolutionary paradigm, which the Holy Alliance could apply (“export”) into the American continent—at least so the European monarchs thought—for crushing the rebellions that had been leading many European colonies in America to their emancipation and independence, in domino-like emulation of the momentous revolutionary paradigm of the American Revolution (1765-1783). The response of the warring Greek revolutionaries to the reactionary deliberations and decisions of the Holy Alliance at Verona, was military:(1) On that day (December 3, 1822), they concluded the liberation (October 29 - September 3, 1822) of the first capital of Greece, Nafplion, from the Ottoman yoke, right after the destruction of the formidable 32.000-men Ottoman «Army of the 5 pashas» under Dramali (Mohamed Ali Pasha of Drama) by the 3.600-men Greek troops under Kolokotronis, the legendary Greek warlord. The response of the United States was even more formidable, because it was geopolitical: By a twist of fate, on that same day (December 3, 1822), a philhellenic thunderbolt lightened the cloudy (or even gloomy) reactionary firmament of the then authoritarian-colonial Europe. It was a geopolitical thunderbolt that was flung from the other side of the Atlantic, by the U.S. Government, against the status quo of the European hegemons in the post-Napoleonic era. That was the first official explicit reference by a leader of an (emerging) Great Power to the national independence of the Greeks and also to their equal station at the level of international law: The U.S. was looking pragmaticallyforward to what Czar Alexander A΄ considered a “chimeric idea” at the time, and to what all other European rulers were then loath even to hear (let alone discuss), i.e. the national independence of the Greeks, despite the fact that the Greek fighters were fully engaged, all alone then, in a fierce and chaotic “war of extermination” (Finlay τ. Ι, σ. 171-172, 236-237) on land and in the seas, the Archipelago and the Ionian sea, in the “southeast corner of Europe” (according to the geographical characterization of Greece by the Holy Alliance in Verona), as forefighters of all Christian Europe against Ottoman theocracy, against Asian backwardness, and against Muslim expansionism (Jihadism). Even more, by Monroe's proclamation, the United States have since emerged as the historically first Great Power whose government explicitly and officially “mentioned” the name “Greece”—more than four years before Russia and England did so by the Protocol of St. Petersburg (March 23, 1826)—i.e. the first Great Power that recognized a political existence of the Greeks as a nation. It is noteworthy that the philhellenic ultimatum Russia against the Ottoman Empire (6 July 1821), and thereby the threat of Russo-Turkish war (referred to in the introductory sentence of Monroe's declaration), were intended for protecting the Greek Orthodox Church and Ecumenical Hellenism (the Greek population throughout the tricontinental Ottoman Empire) primarily in non-combatant regions under Ottoman yoke, against indiscriminate Turkish reprisals in such regions for Greek victories in war zones. Still, the Russian ultimatum included verbal qualifications and conditions (explicit or implicit) as to the fate of armed Greeks (soldiers, guerillas and seamen) in war zones within the Ottoman Empire. On the contrary, the unconditional philhellenic Presidential statement of the United States (1822) pertained to the Greeks in war zones, as descendants of the ancient Greeks and forefighters of Christian Europe, with a maximalist wording as to the anticipated (positive) outcome of the Greek War of Independence—an outcome that, according to the U.S. Federal Government, could soon be nothing less eventually than the national independence of Greece. In sum, that proclamation of the U.S. Government was historically the first unconditional philhellenic declaration by a leader of a great country in favor of the Greek forefighters in war zones. The Presidential declaration was not merely the product of a “sentimentally” philhellenic predisposition of the American Government, although the U.S. foreign policy was led then by Philhellene John Quincy Adams, a prominent statesman in American History, then U.S. Secretary of State (1817-1825) and thereafter (6th) President of the United States (1825-1829). 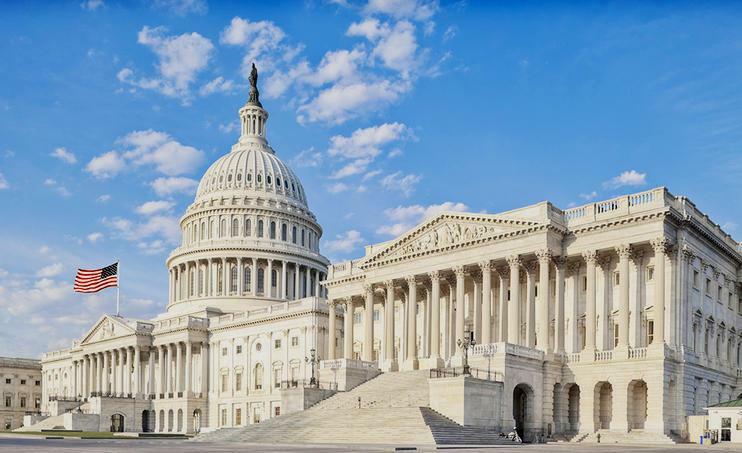 Nor was it a product of political expediency, in light of the Philhellenism that was then spreading to the U.S. electorate, even though the declaration referred explicitly to American Philhellenism at the end of the paragraph (second to last sentence). The real importance and outlook of that groundbreaking declaration was geostrategic, as demonstrated in the following year (1823): The philhellenic declaration of the United States (1822), amounted essentially to a “prelude” of the philhellenic proclamation of the “Monroe Doctrine” after just 12 months (December 2, 1823). That is, Monroe's philhellenic declaration in 1822, with all that it mentioned explicitly (concerning the national “independence” of liberated Greece, as a geographically small country but still of “equal stature” with the Great Powers) and implicitly (US potential support of the Greek revolutionaries, an option that was not explicitly precluded in the declaration), was virtually a preview of the philhellenic dimension of the “Monroe Doctrine”, which at the time, during the Congress at Verona and the following months, was being formulated by the leadership of the United States. In case of “any” indirect (politico-economic) counter-revolutionary involvement by a European Power, “in any other manner”, against an emancipated-independent former colony in the American continent, the U.S. projected implicitly, as deterrent, their own resolution for indirect (revolutionary) counter-involvement in Europe, and even in asymmetrical “manner”, namely, by offering substantial material and economic U.S. support to the warring Greeks, in order to put into effect chaotically, all across Europe, the Greek ethnic-liberation paradigm—which threatened to motivate or even instigate the peoples in the multinational mosaic of Europe towards their (national) emancipation from their hegemons—to the eventual dissolution of all (multinational) empires in Europe. Within that context, the resolution of the United States, at to its counter-offensive contingency option, underlies the emphasis of the proclamation of the Monroe Doctrine on the “heroic struggle of the Greeks”, i.e. Monroe's explicit and extensive reference to the Greek War of Independence—and indeed in the most prominent position of the proclamation, i.e. as an introduction to the main text of the Monroe Doctrine, which otherwise, in theory or in first reading, pertained primarily to the American (not the European) continent. [painting by Benjamin Latrobe (1800-1856)]. It should be noted that John Quincy Adams, the mastermind and author of the Monroe Doctrine, had an outstanding knowledge of the vulnerability (“Achilles' heel”) of the seemingly powerful authoritarian (monarchic) regimes in mainland Europe: destabilization from within, through popular revolutions with democratic and national cause (per the Greek paradigm). 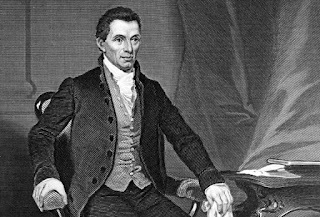 Adams' knowledge of that vulnerability was not merely theoretical but also experiential, since, before taking up his duties in 1817 as U.S. Secretary of State, he had previously represented his country as the historically first U.S. ambassador in Russia in 1809-1814, i.e. in the most critical and perhaps most glorious period of Russian history up to that time. Adams was then fortunate to experience personally the titanic struggle of Russia against the Grande Armée of Napoleon and to develop, from then on, a personal relationship of mutual respect with Czar Alexander A΄. He had also obtained personal knowledge of the weaknesses of Russia, as well as those of England (where he served as U.S. Ambassador in 1814-1817) and France (where he resided during the «100 Days» of Napoleon in 1815). As result, in combination with an effective sense of measure that distinguished him (he was a classicist at an academic level, with profound knowledge of both Latin and Ancient Greek), Adams knew how to neither underestimate nor overestimate military or political threats from the Old World (Europe) against the New World (America). 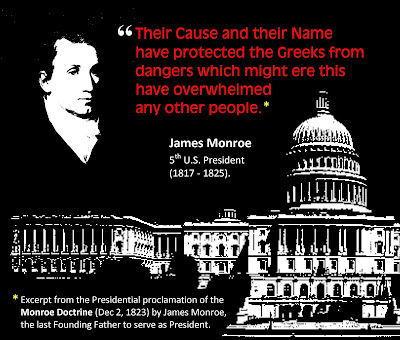 President Monroe, through his successive philhellenic proclamations in 1822-1823, demonstrated that the U.S. Government was the first to realize that the Greek revolution was ethnocentric—barely a social rebellion against an unpopular regime, in emulation of the (failed) French Revolution—and, consequently, that the independence of Greece would mark the beginning of a new era, in which the natural (anti-hegemonic, anti-colonial) principle of ethnicity would replace the artificial (hegemonic-colonial) principle of legitimacy. Therefore, the Greek War of Independence brought the nations of Europe and their right of ethnic self-determination, regardless of the size of every nation's population, to the fore of the European political stage. Consequently, it is from Greece were the revolution and emancipation of the nations spun off at a pan-European level, or even (given the Eurocentrism of the era) at a global level. In that evolutionary context, the philhellenic proclamation of the Monroe Doctrine undermined and shook the very foundations of the Holy Alliance (which collapsed in the following year, 1824), and signaled the beginning of the end of allempires, i.e. not only the multinational empires (like Metternich's Austrian Empire or the Sultan's Ottoman Empire) but also the colonial empires as well, due to the two successful ethnic revolutions in the “Age of Revolution”(Hobsbaum 1961): the ethnogenic American Revolution in the New World in the 18th century, and the ethno-liberating Greek Revolution in the Old World in the 19th century. Indeed, as reflected on subsequent historical developments worldwide, since small Greece managed to be liberated (from barbarous imperial yoke) in the 19th century, it would thereafter be inconceivable for great India not to be liberated as well (from comparatively civilized colonial dependence) in the 20th century. The enormous power and the chaotic dynamic of nationalism when it becomes idealistic (patriotic), are implied in the proclamation of the Monroe Doctrine, whereby the U.S. President attributed the military and naval triumphs of the Greeks, against the armies and fleets of a huge (tricontinental) empire, to the purely idealistic value system of the Greek forefighters, by his saying that “the ordinary calculations of interest and of acquisition with a view to aggrandizement, which mingles so much in the transactions of nations, seem to have had no effect in regard to them” in 1821-1823. That splendid deduction of John Quincy Adams, as to the ethno-liberating (or even chaotic) potential of (idealistic) patriotism, would be ever since, until World War II, the cornerstone of the anti-colonial foreign policy of the U.S., that for many decades was looking forward to the inevitable (or even teleological) dissolution of all colonial empires. 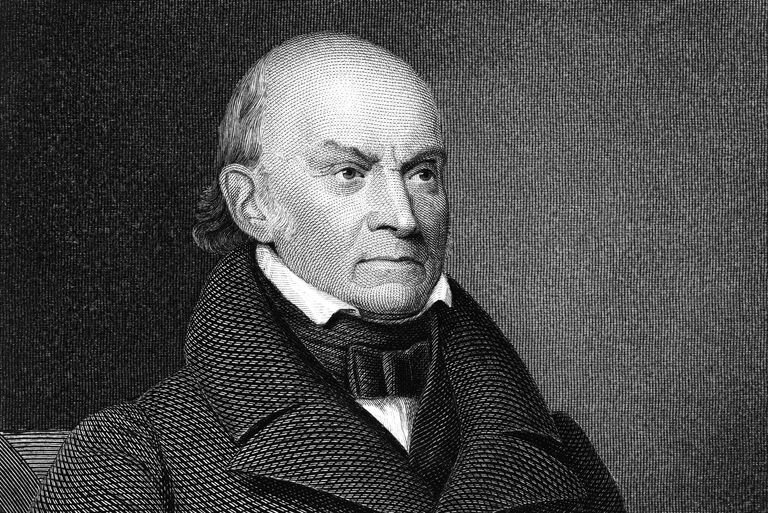 Another pertinent deduction of John Quincy Adams, as proclaimed in the Monroe Doctrine, is of lasting importance: President Monroe stated that the prime factors of the victories of the Greeks were “their cause and their name” that“have protected them from dangers which might ere this have overwhelmed any other people”. That is, according to the view of the U.S. Government, the Greek victories in war zones were due to the idealistic ehno-patriotic cause of the Greek revolutionaries (national independence and political freedom), while the effective protection of Ecumenical Hellenism by Russia in non-combatant regions, under the shield of the Russian ultimatum (1821) and the subsequent threat of Russo-Turkish war in 1821-1826, was due to the historical name of Greece as the cradle of Western (Greco-Roman and Christian) Civilization. In sum, according to the mutual point of view shared by both James Monroe and John Quincy Adams, as far as Greece is concerned, the ethno-patriotic cause of the Greeks and their uniquely great name legacy (“Greece”, “Hellas”, “Ionia”, “Crete”, “Cyprus”, “Macedonia”, etc.) are fundamental factors of national security and, as such, non-negotiable and hardly amenable to any cession, then and ever after. Even more, the Greek response was also humanistic: Under strict orders of the Government of the neonate democratic Greek state, the liberation of Nafplion was orderly, i.e. without retaliatory massacres against the (surrendered) Turkish defenders of Nafplion. On December 3, 1822, Kolokotronis ordered the Greek troops to stay outside the gates of Nafplion, in order to avert looting or even such massacres. The Turkish defenders of Nafplion embarked on Greek ships under Greek Admiral Miaoulis, as well as on the English frigate Cambrian under Captain Hamilton, on December 12, 1822, and thereafter were transported safely to non-combatant Anatolia (to Smyrna and Kusadasi), in accordance with the terms of the pertinent treaty of their capitulation. “ A strong hope has been long entertained, founded on the heroic struggle of the Greeks, that they would succeed in their contest and resume their equal station among the nations of the earth. It is believed that thewhole civilized world take a deep interest in their welfare. Although no power has declared in their favor, yet none according to our information, has taken part against them. Their cause and their name have protected them from dangers which might ere this have overwhelmed any other people. The ordinary calculations of interest and of acquisition with a view to aggrandizement, which mingles so much in the transactions of nations, seem to have had no effect in regard to them. From the facts which have come to our knowledge there is good cause to believe that their enemy has lost forever all dominion over them; that Greece will become again an independent nation. That she may obtain that rank is the object of our most ardent wishes. Ανώνυμος 9 Δεκ 2018, 12:09:00 μ.μ. Ok! Now I am starting to understand why the Greeks have developed a love-and-hate relationship with the U.S. (but with lots of love indeed!). By the way, a question to anybody who might know the answer: Has ever the Greek Army engaged in any fight or mere skirmish (however minor) against American troops in the last 200 years, under any circumstances (as it did against French and British troops in mid-19th century, German and Austrian troops in WWI, Russian troops in post-WWI, German and Italian armies in WWII, and China in the post-WWII Korean war)? It seems that the Greeks have been prone to raising arms against every big power on earth. But what about the U.S. though? Thanks to any one who might shed some light on this (I hope reasonable) question. John Pappas 13 Δεκ 2018, 1:47:00 μ.μ. To ROBERT FRAY: Up to 1973, the answer to your question would be rather easy and straightforward: For 152 consecutive years, in 1821-1973, there had been neither an incident of military confrontation, nor even a THREAT (explicit or implicit) of such confrontation between any unit of the Greek Army and any unit of the U.S. Armed Forces. Thus the (philamerican) "love" part of what you characterize as "love-and-hate relationship". Still, in 1974, amidst the mess of the CIA-instigated military coup d'état (June 15, 1974) of the Greek junta (1967-1974) against the elected President of democratic Cyprus Archbishop Makarios, and during the ensued invasion of Cyprus by the Armed Forces of Turkey (June 20- August 18, 1974) assumedly to re-establish constitutional order in the island, there were some THREATS (both explicit and implicit) of military intervention of British and American armed forces against the Armed Forces of Greece: For example, If the Greek Air Force sent its squadron of (18) Phantoms F-4 on a mission to Cyprus to destroy the Turkish fleet in a few hours (Turkey had no such high-performance heavy-load long-range fighter-bombers at the time), then the Greek squadron would be intercepted by the British, probably jointly with the Americans (the first based on the two English military bases in Cyprus, and the second operating from the U.S. Navy's 6th fleet, which has been deployed in eastern Mediterranean to that end then), which might probably explain the "mysterious" inactivity of the Greek Air Force during the Turkish invasion of Cyprus, and the military defeat of Greece in 1974. All the events and aspects of this issue--involvement of the CIA in a MILITARY coup that provoked the INVASION of Turkey, as well as THREATS, explicit (Britain) and implicit (the U.S.), against the Armed Forces of Greece, in protection of the Turkish Fleet--are only now starting to come to the fore, as the so-called "CYPRUS FILE", is gradually becoming public (it was classified until 2017). Thus the (anti-american) "hate" part of what you characterize as "love-and-hate relationship". In any case, the history of the Greek defeat in Cyprus in 1974, has not been written yet. ROBERT FRAY 15 Δεκ 2018, 5:46:00 μ.μ. Thanks for the info. I hope the Cypriot or the Greek state uploads the documents, especially those pertaining to Angloamerican or NATO involvement (Cyprus 1974), with official translations in English for interested historians to read.